People are now able to buy their postage online, without any stamps, for the first time under a new free initiative from the Royal Mail. Customers pay for postage by credit card over the internet for first-class, second-class, recorded, special and international deliveries. 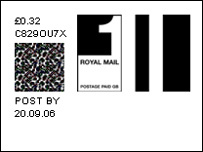 Each item of mail is given a barcode, printed off at home, and regular mail can then be posted in a post box. But recorded and special delivery items must still be taken to a Post Office. That is so they can enter the mail "tracking" system which enables customers to follow the progress of their items online. Royal Mail said the scheme would improve choice for its customers. The service is available 24 hours a day and it is hoped will reduce queues in post offices. Postage purchased online will cost no more than the normal rates. The service is free and is different from the SmartStamp service - costing £4.99 a month - which Royal Mail says is aimed at small businesses, and provides a company logo next to the mailing print-off. Royal Mail, whose monopoly on postal deliveries ended at the start of the year, said it believed the new service would appeal particularly to home workers and to people who sell goods via eBay and other auction sites. "We have launched this service in response to demands from the public who want to be able to buy and print their postage online, direct onto an envelope or a label," said Alex Batchelor, its marketing director. The Royal Mail would not be drawn on how many people it expected to use the service in its first year. But it said that with growing take-up of broadband internet connections, it expected the service to have mass appeal. Royal Mail's letters business made a £344m profit last year but its post office network has been losing £2m a week. Will the online postage system mean the death of the stamp?